Anyhoo, one of the most recent things that I've done (other than play video games) is attend a Halloween party. Friends invited my folks (and I crashed, which was actually OK with the hosts) to this party, with the invitation itself being a blank mask with instructions to decorate. I didn't know what I was going to make mine into until the day of the party and opted for making it into a puppy dog, with a pair of socks for doggy ears. 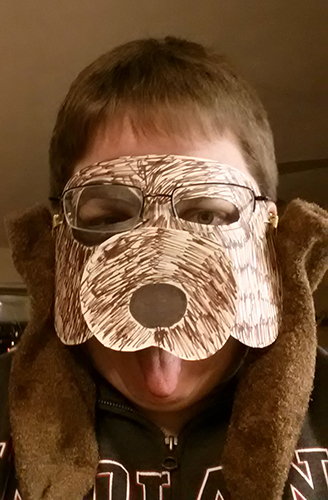 I wound up winning the prize for most creative mask. Dad, meanwhile, had cut out his mask and had me print "Generic Mask" on it neatly. He glued it to a stick (ala Renaissance masks) and wound up winning the Funniest mask. Heh. Mom then topped us during the pumpkin carving competition by getting a special award for her puking pumpkin. A family of winners - woo! Tomorrow I'll post punkin pix. Oh, and this year will be my first year attempting National Novel Writing Month (AKA NaNoWriMo). Hoping it might jumpstart my blogging and possibly curb my gaming. Guess we'll just have to wait and see! Anyone have a novel plot idea??? ?